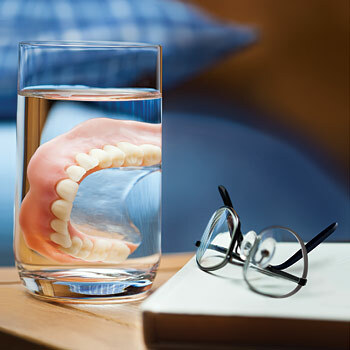 When you think of dentures, you may picture a full set of upper and lower teeth, complete with pink gums... sitting in a glass full of water on the bedside table. But did you know that the word “dentures” is actually used to refer to several different types of prosthetic teeth? For example, there's the fixed partial denture (commonly called a “bridge”), the removable partial denture, and the removable full denture (the one in the glass). It's also possible to have a full set of dentures which are securely fixed in the mouth. What's the difference between all of these “dentures”? Essentially, a removable denture (as the name implies) is easy for you to take out, while a fixed denture can only be removed at the dental office. But when you're choosing between these two types, what's at issue is more than just removability — there are major implications for your health and self-confidence, too. Once upon a time, removable full dentures were the best — and indeed, the only — prosthetic teeth-replacement system dentistry could offer. However, removable dentures come with problems. Their instability in the mouth often requires the wearer to make constant adjustments and compromises, such as eating primarily soft foods and being extra-careful when speaking and chewing. In time, even after one has learned to get by with them, they eventually lose their fit. This happens because wearing them accelerates bone loss in the jaw, which inevitably occurs after tooth loss. 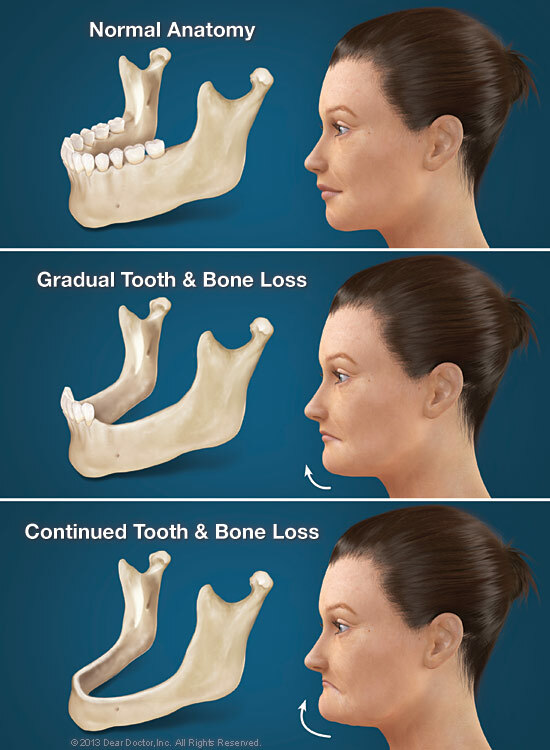 Accelerated bone loss results from the pressure dentures place on the bony ridges that formerly supported the teeth. The loss of bone tissue inside the jaw is invisible; its effects, however, eventually become easy to see. When teeth are lost, the nearby bone is resorbed (melted away) by the body's natural processes. In time, bone volume and density decrease significantly; that's why dentures stop fitting correctly. As the bone shrinks, the distance between your nose and chin decreases too, and support for facial features collapses. Let go long enough, it can make you look prematurely aged and unhappy — whether you're wearing your dentures or not (View Example). 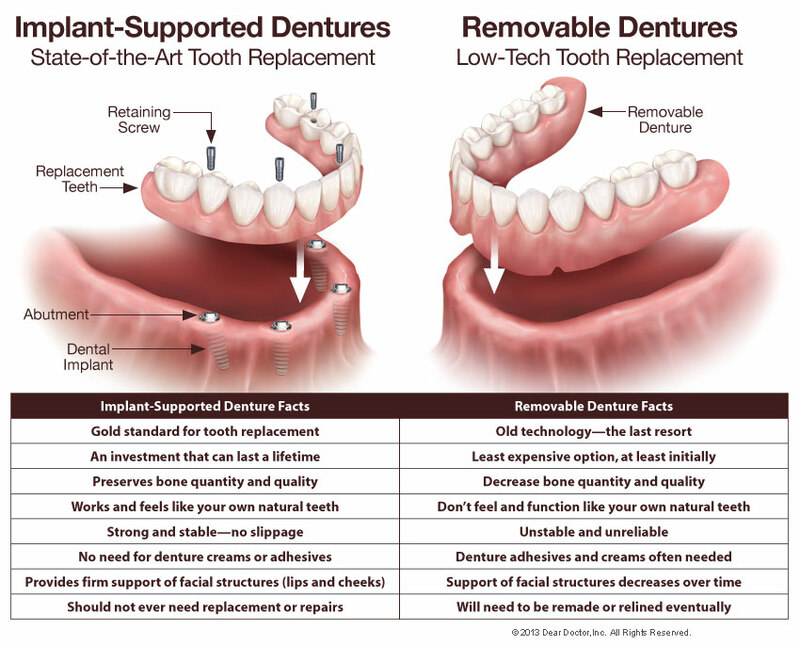 While removable dentures don't stop bone loss, there is a way to permanently replace a full set of teeth and prevent bone loss as well: implant-supported dentures that are fixed in your mouth. Anchored firmly into the living bone tissue, dental implants provide the stimulation and support needed to prevent bone from being lost. The bone in your jaw actually fuses to the implant, due to the remarkable osseophilic (bone-loving) properties of titanium, the metal of which dental implants are made. 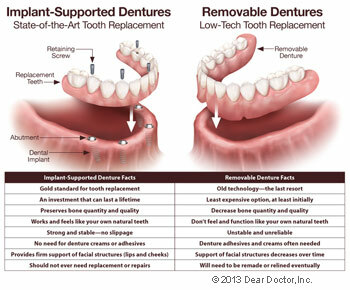 Because of their firm anchorage, implants form a strong and solid foundation for fixed dentures. It can take as few as four implants to hold a complete set of upper or lower replacement teeth. When dentures are attached to implants, you never have to worry that they will loosen or slip. That means you can eat whatever you want, speak normally, and forget all about bothersome denture creams and adhesives. People who choose fixed over removable dentures report that this system feels much more like their own natural teeth, and that it improves their quality of life. On the other hand, over half of people who wear lower removable dentures report they are unsatisfied with their stability and comfort. Though implant-supported teeth are more expensive initially, they are the best long-term investment as they will never need to be replaced or remade. We would be happy to discuss the costs and benefits of each of these options with you at your next consultation.